Sorry, but that’s not possible at this time. What is about supporting speech in other languages, Russian, for example? Google controls the speech recognition, so there’s nothing I can do about that. I can’t find the icon!! Is it possible to get n-best results instead of only the best one? Hey there,my name’s Moliere,I have a question. “I’ve already installed VOICE SEARCH”on my computer,but when I click on that ICON,nothing works. Am I missing something or what,please HELP!!!! This works on CR-48 with new update, but I noticed that it will only fill in one location in a query. For example, I have a search engine that looks like this: http://gatherer.wizards.com/Pages/Search/Default.aspx?name=+%5B%s%5D||type=+[%s]||subtype=+[%s]||text=+[%s]. Thanks. I just fixed this in version 1.0.5. The update should get to you soon. i was going to download this, but this freaked me out. why do you need access to All data on your computer and the websites you visit” ?? To be able to add speech input buttons to text fields on all websites. Good afternoon. 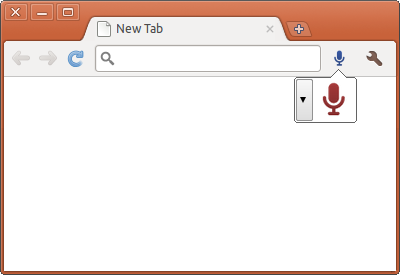 I’m using your extension voice search in google chrome. Thank you for that.But I have a problem with its use. I hope you can help me. Search All text fields shallfine, but not in the address bar searches. When you click on the button in the upper right corner of Google Chrome, nothing happens. Impressive, this is remarkable. It even can understand indonesian accent.